Goznak is the company which produces postage stamps in Russia, and has done so, in earlier incarnations, for well over a century. For forty years - years that saw momentous upheavals in its country's history, from the Holodomor via the Gulags, the Purges and the Nazi Invasion to the Cold War and the Space Race - that company's Head Artist was Ivan Ivanovich Dubasov, born in 1897, working throughout those events (surviving, we might even surmise), and dying full of years, Orders, Medals and other honours conferred by a grateful nation, at the ripe old age of ninety. So much can be gleaned from a simple online search. What follows is not a scholarly article, for answers which lie in Moscow archives, in the Goznak historical records or in specialised journals are outside the grasp of this writer. It is instead a series of surmises, inferred from basic catalogue entries and illustrated with the writer’s own stamps, or with images derived from the internet. Sadly therefore, it is speculative rather than authoritative, but the author would welcome any correction from a Russian expert, or contribution from anyone at all who finds this article of interest. The Russian stamps of the 1920s made little concession to contemporary trends in art and design. Heavily bordered, and frequently depicting archetypal Russian workers, they were utilitarian rather than imaginative. There were, however, exceptions. 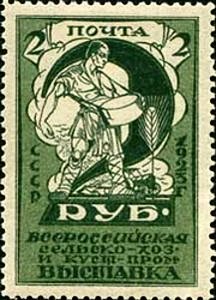 The first Union stamps, issued in August 1923, used four interesting designs to illustrate an agricultural exhibition in Moscow. Here (left) is the pleasing 2 ruble stamp, in which the denominational figure entwines itself around a sower of seed. The other three are as attractive, although not, perhaps, to the authorities at Goznak. There were to be no more fancy numerals, and the services of the designer were not required again. Georgiy, or Grigoriy (we shall not know) Pachkov is heard of no more. The 25 year-old Ivan Dubasov, however, had made his debut ten months earlier with a design almost as striking. 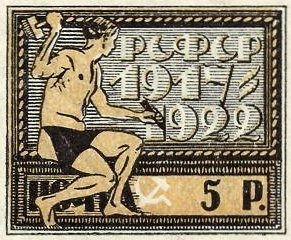 To celebrate the fifth anniversary of the October Revolution, four stamps were produced, featuring a stone carver hammering out the relevant dates onto a wall-plaque (left). But for the strategically-placed apron and the severe haircut, he could be a classical Greek sculptor. If to our eyes he seems a tad under-dressed to represent a real Russian compared to Pachkov’s sensibly-clad farmworker, the people at Goznak presumably saw something they liked in Dubasov’s first effort. The death of Lenin, on January 21st 1924, had been long expected. Did Goznak have the matter in hand for the inevitable mourning issue – its designer properly briefed, its printing works and distribution systems at the ready? Or was it a rush job, ‘dull colours’ (Stanley Gibbons’s phrase), no perforations, a rough-and-ready design, done and dusted within a week, with three further issues required that year as and when time allowed? Two facts are certain: the first stamps were ready within a week, and the designer they turned to was Dubasov. 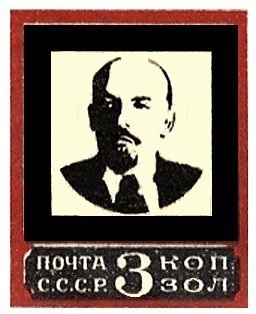 The Lenin mourning stamps show a part-silhouette image of the premier within a black square on a red background (left). The value tablet, also black, is separate and beneath – in some printings slightly misplaced so that the white background is revealed. There are four values. It’s a notably simple design, compared to previous Russian stamps. It may have taken no more than a couple of hours’ work at the drawing-board. 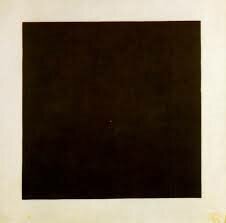 On the other hand, it may reference one of the most famous works of Russian art known to Dubasov – one which he would have marvelled at and thought about when a student: Kasimir Malevich’s Black Square (right). In 1924 the days of socialist realism were yet to come – Malevich was still director of the State Institute of Artistic Culture at Petrograd – and it would have seemed a forward-thinking tribute to the founder of the state, as well as a nod to contemporary Russian art. Lenin’s successor did not approve. Malevich’s Institute was closed down. Dubasov lay low, to reappear five years later with a completely different style of design (below, left). One of two issues to promote industry, it is dominated by a large semi-circular image of an angle-grinder, from which issue zig-zag sparks of heat and no fewer than three slogans, of which the first is “For Lower Prices” – the others are indecipherable to a non-Russian reader. The entire design, with its broad-backed worker and stylised cog-wheel (for the value-tablet), has a liveliness and sense of urgency quite lacking in the work of other designers. In 1931 Dubasov joined four other artists in the Airship Construction Fund set: his, the lowest value (above, centre), was a notable effort dominated, of course, by the airship, but accompanied quirkily by a camel and a reindeer, signifying the geographical range of the mighty craft. Another in the set was less symbolic and focused on a globe-wide map of Russia, the flight of the Zeppelin, this time across the North Pole, carefully marked. This was the work of Vasily Zavialov, of whom Russian stamp design was to hear more. The prize of being chosen to design the entire Graf Zeppelin North Pole Flight set two months later (if indeed the earlier set was a design-off between five young artists of Goznak) went not to the geometrical flight-paths of Zavialov, but to the charming animal imagery of Dubasov. 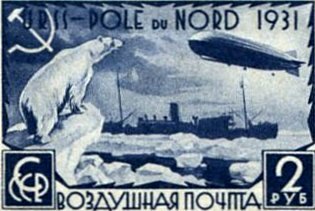 He responded with a design (above, right) combining the airship with a polar bear on an icy outcrop and what looks like an ice-breaker ship, possibly held fast in an icy sea. Rather than the solid Cyrillic of the earlier set, Dubasov opts for an attractive Art Deco typeface with a French inscription “URSS – Pole du Nord 1931”. This expedition was an international affair, crewed by Germans, Americans and Russians, who provided the chief scientist, the meteorologist, the flight engineer and the radio operator. So why the French inscription? Was French the scientific lingua franca which enabled the motley crew to converse? But was not French also the preferred language of the upper classes of Tsarist Russia? Was Dubasov sailing close to the wind? Whatever the case, Dubasov did the next set, a more conventional Express Letter issue, featuring low-angle shots (possibly from photographs) of motor-cycle, truck and train, and four months later the one after that, for the 2nd International Polar Year, in which he borrowed Zavialov’s global perspective and made a map of the North Pole the central feature of the design. With three consecutive full sets, Dubasov had arrived. Indeed, during or after the two 1932 sets, the young 35-year-old was appointed Head Artist at Goznak, a post he was to retain for another forty years. 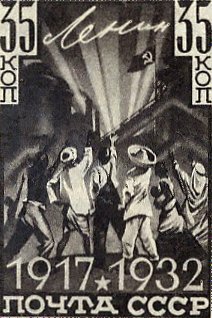 He celebrated with one of his most notable designs (left), the top value of the 15th Anniversary of the October Revolution. This is a remarkable piece of work. Six workers contrast dramatically in shade (the stamp is ‘black-brown’), but more controversially they are not exclusively Russian. There’s an African in there, an Indian and an Arab, even (perhaps) a white-suited Latin-American and a black mother and child. Perhaps only the central figure, in shirtsleeves and dungarees, is Russian, but he could as easily be British, or American. The message, as all six salute the powerful beams of Leninism (that’s Lenin’s signature at the top), is that the revolution is not just for the Soviet Union, but for the whole world. This stamp is rare enough to set you back the best part of £100 today. Such an internationalist position was bold. I do not know if it was as blatantly repeated again. Perhaps it was not popular. Perhaps Dubasov was reminded that intra-Soviet unity was a more pressing issue than attempting to seduce the workers of the world. Whatever the case, the following year a long set of stamps celebrated various racial types – twenty-one of them, every one from within the Soviet Union. Four designers worked on this set, but the catalogue does not distinguish individual contributions. Among them was Vasily Zavialov. At this point something unusual happens. Dubasov disappears, and Zavialov takes over. Of the next thirty-three sets, over five years, Vasily Zavialov designs twenty-two: Ivan Ivanovich Dubasov does not design any. Someone will know the explanation for this – the present writer can only speculate. Was there an internal power-struggle at Goznak, in which the younger Zavialov successfully sows suspicion in the minds of greater powers that the Head Artist is dangerously bourgeois in his florid designs and dubious internationalism? Was the Head Artist cunning enough to lie low, and then to strike at the right moment (yet another North Pole issue, in 1938), consigning Zavialov to an obscurity whence he was not to return for another eight years? It makes for a dramatic narrative, but the reality may well be more mundane. Stamps were not the only responsibility Dubasov inherited at Goznak – he designed banknotes, orders and medals. Perhaps he had that side of the company to knock into shape; perhaps Zavialov, so far from being a rival, was a trusted lieutenant. Perhaps Zavialov even joined the Red Army, fought valiantly for the fatherland, and returned to stamp designing with a hero’s welcome and the subject of the newly-deceased Soviet President. Only the facts of the catalogue are certain: Dubasov had a five-year break from stamp design between 1933 and 1938: Zavialov’s, between 1938 and 1946, was rather longer. With Dubasov back in the driving seat and the Great Patriotic War still three years in the future, it may be time to ask some further questions. We know that Ivan Ivanovich was the Head Artist at Goznak – we do not know the line of management between Goznak and the People’s Commissariat for Communications (formerly ‘for Posts and Telegraphs’), a government office re-established under its new name in January 1932. There were six holders of the office of People’s Commissar from that point until the end of the war (when it was reformed and renamed again), and a period of ten months in 1937-8 when the post remained vacant. It’s instructive to look at some of these men. 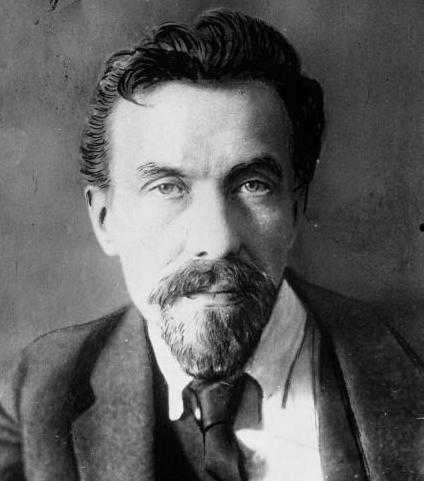 The first was the ill-fated Alexei Rykov, once a major player, now (it seems) kicked upstairs to a politically harmless position: he was arrested in early 1937 and executed a year later. 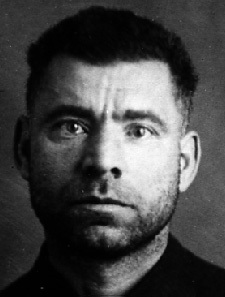 His successor, briefly, was the terrifying secret policeman Genrikh Yagoda; he was purged, despite his desperate pleas, at the same time as Rykov. 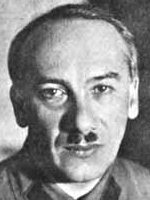 For four months the bureaucrat Khalepski (about whom records at this time are silent) succeeded to the post, but his successor Matvei Berman was, like Rykov and Yagoda, also a major player on the way out – demoted from Head of the GULAG, and later shot. With the removal of Berman in July 1938 the office became vacant. The Great Purge over, and with three out of its four chiefs dead, the Commissariat came under the control of the military administrator Ivan Terentyevich Peresypkin, who held this and other offices in the Red Army with apparent success throughout the war. What can we deduce from all this? Clearly the People’s Commissariat for Communications was a minor post, either for temporary bureaucrats like Khalepski, or for those who were rapidly falling out of favour like Rykov, Yagoda and Berman. Presumably they presided over Goznak, but we do not know at what distance, or to what extent their power affected the designers, artists and printers who produced the stamps of the USSR. What is evident is this: the time of greatest upheaval at the Commissariat coincided with Dubasov’s apparent absence at Goznak. By the time the third of these once powerful men had served their turn and left for the condemned cells, the Head Artist’s first design for five years had been on sale for less than a fortnight. Were the artists in danger during the time of the purges, or were they simply too insignificant, able to carry on their work without fear of the knock at the door at 4am? Were the NKVD remotely interested in postage stamps? 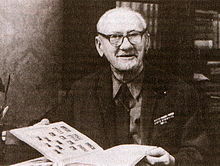 As you look at the benign features of old Ivan Ivanovich Dubasov, cheerily turning the pages of his stamp album, the questions remain: to survive, was he a ruthless conniver, a canny operator, or merely so harmless as to be beneath the consideration of the brutal power struggles of his day? In the second part of this article I’ll look at Dubasov’s wartime designs, and then identify some of his favourite themes in his post-war career.